Lawyers and the law have long been the object of popular criticism and satire for the obscurity and incomprehensibility of their language. Legal Discourse provides a novel historical and systematic account of the language of the legal institution together with a sustained criticism of legal exegesis and `legalese' more generally. In the first part of the work the doctrinal history of the legal discipline and its concepts of language, text and sign are examined and assessed. 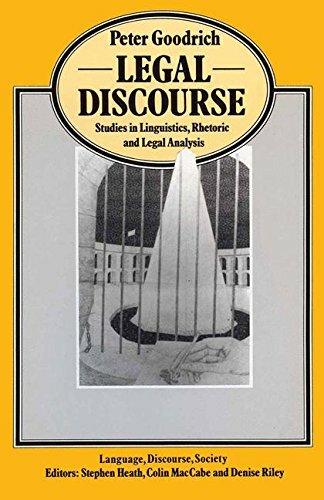 In the second part the contemporary disciples of linguistics, discourse analysis and communication studies are brought to bear upon the task of constructing a theory of legal discourse as a linguistics of legal power. If you have any questions about this product by Peter Goodrich, contact us by completing and submitting the form below. If you are looking for a specif part number, please include it with your message.